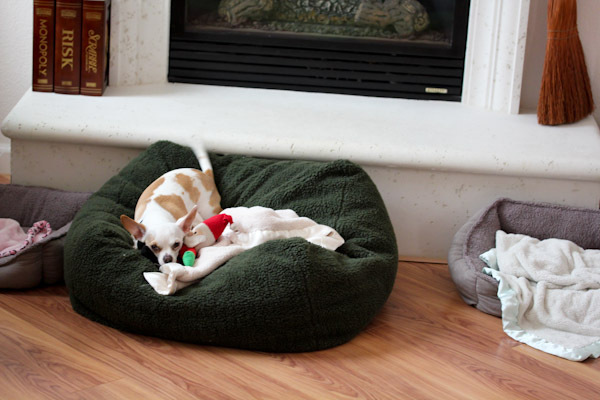 After a long day at work, I just love coming home to hubby and happy wagging chihuahua tails. Miko sits patiently watching me and waiting for any hint that I’m ready to play. He tries to play it cool, but that tail starts going 50 million miles per hour as soon as I look at him. So sweet and I’m looking forward to parking in front of the fireplace with him on cold winter nights which are, eek, just around the corner! 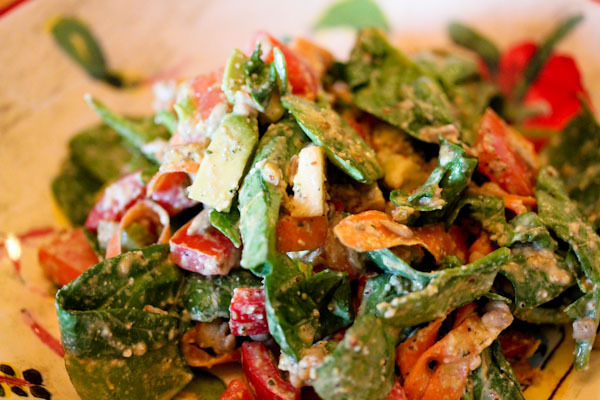 But for now, it’s still summer here with highs in the 90s and I’m craving lots of salads. 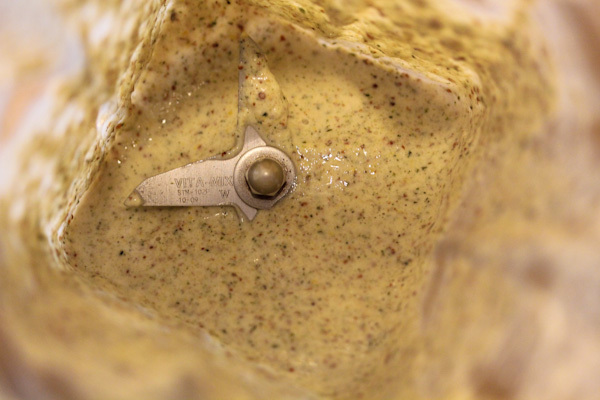 A great excuse to create another raw blender salad dressing. 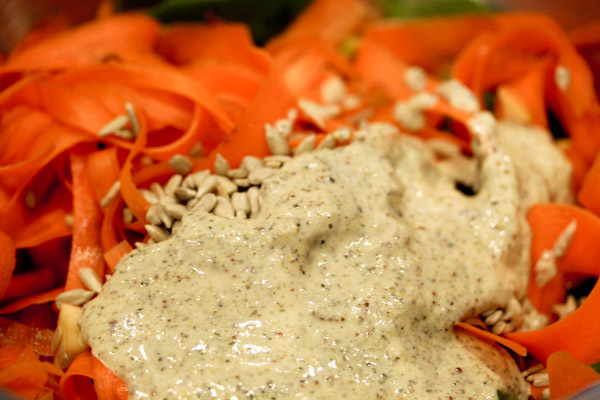 This dressing is inspired by the Sweet Mustard Dressing in Jennifer Cornbleet’s Raw Food Made Easy, one if my first and still favorite raw recipe books for fast and simple recipes. I modified this dressing by replacing the oil with hemp seeds making it creamier, higher in protein and nutrients, and more fun to coat a salad in. I left the texture a little more grainy to keep the mustard grains visible, but you can blend is longer for a smoother texture. The dressing is very thick and creamy, it was a little work mixing it into a salad and could also make a great dip. It coated the salad nicely with a sweet and tangy creaminess. 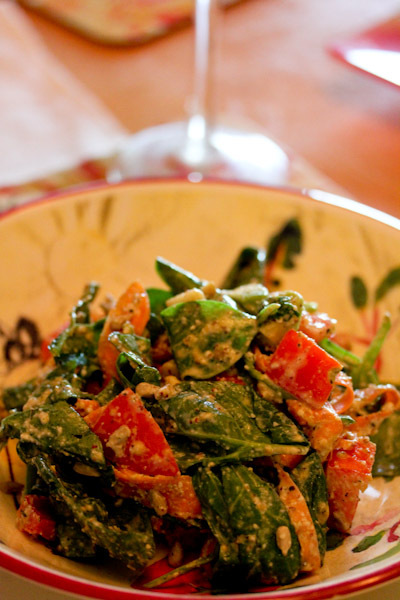 And added the perfect amount of zing to liven up a simple spinach salad with a little sweetness, sour, and savory tang. If could work well with added fruit into the salad like chopped apples, berries, or pear. With warm weather coming to an end soon, I’m enjoying as many cool and fresh salads as I can before they’re less appealing on a cold and rainy winter evening!